Shipping $365.00 Add item to cart for shipping estimate. You can SAVE on shipping by buying multiple items from the same seller. Shipping is charged by each individual seller. Sellers at times may also provide FREE SHIPPING on select items or on entire order if it meets the minimum order value. Please check sellers page for more details. Give your home a maharaja look. 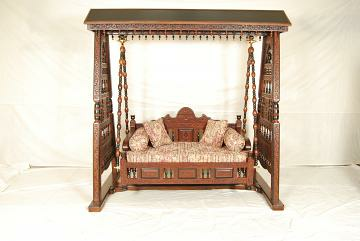 This royal design jhoola (indoor swing) has intricate carving all over and is all hand made. Shipping Cost $365.00 Buy multiple items online from Kashmir Interiors to SAVE on shipping. All orders are shipped within 5 to 7 business days. Due to the nature of the product, we cannot accept return on any other the furniture related item. In case of any damage etc, please reach out to us within 3 days sow e can resolve your issue. This item in Indian Jhoola / Swings category was first added to our catalog on 12-14-2017. 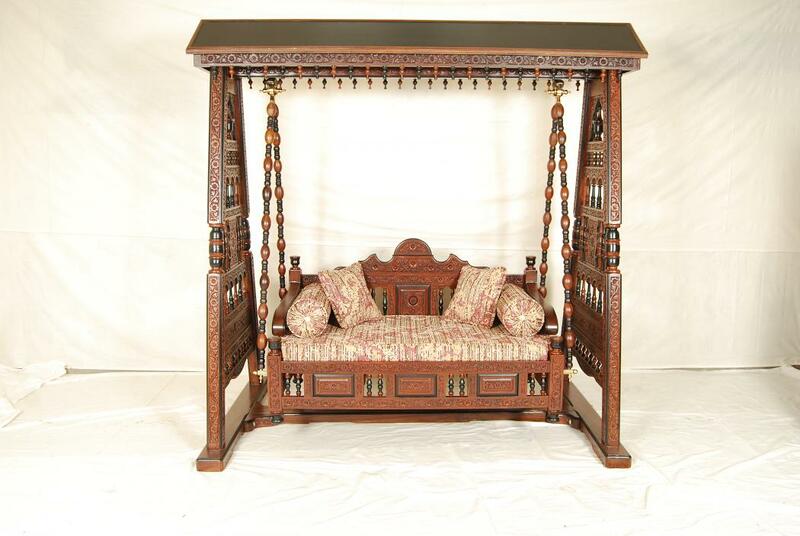 Buy Maharaja Style Solid Wood Carved Swing/Jhoola, sold & shipped by Kashmir Interiors where you can shop online for Traditional Design Hand Carved Furniture, Swing, Diwan, Table & more. This Maharaja Jhula collection has been tagged as Chair, Sofaset, Indian Home Decor, Living Room Furniture, Indian Handicraft, Indoor Jhula. We live in Dix Hills in Long Island New York. How long will this take to deliver and does the price inclue installation price. Also any other information you guys believe is usesul for me ti kow pleaze let me know. My family and I are very interested in buying this.